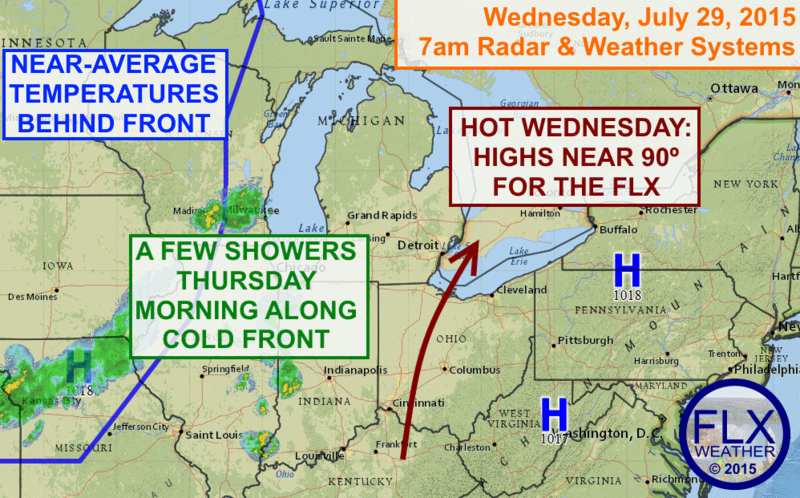 A hot day is in store for the Finger Lakes on Wednesday, with most locations getting near 90º and a number of spots reaching the low 90s. High pressure to our southeast and an approaching cold front have combined to set up a conveyer belt of hot air from the Deep South into the Finger Lakes. The high pressure will remain the primary factor in today’s weather, keeping the skies sunny (for the most part) and precipitation at bay. A period of some cloudiness will likely move through some areas this morning, but the day should be sunny otherwise. Temperatures will be hot today, with highs this afternoon near or a couple degrees above 90º for many locations. 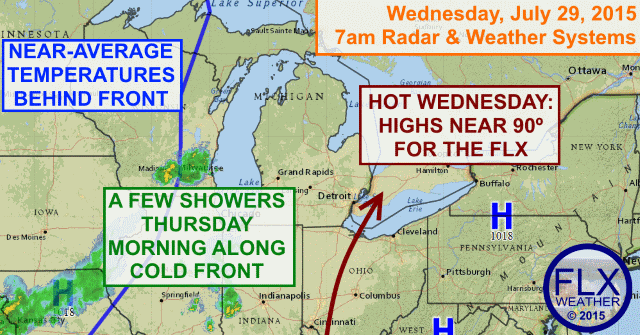 A few of the typically cooler locations in the higher elevations of the southern Finger Lakes will likely stick in the upper 80s, but some areas in the northern Finger Lakes, along the Lake Plain, could flirt with the mid 90s. The humidity levels today will actually be somewhat tolerable, given the high heat. Dew points should stick mostly in the 60s, resulting in a heat index that is just a couple of degrees warmer than the actual temperature. This is in contrast with our last hot day, July 12th, when the humidity was oppressive and the heat index was 5-10º above the temperature. Our temperatures will get reset back to normal levels on Thursday following the passage of a cold front. This front will likely slide through during the morning hours on Thursday, so most of the scattered precipitation will probably be light showers. One or two thunderstorms may pop-up, but they should not be severe. Some areas will likely see no rain tomorrow, or so little that it makes no lasting impact on what has turned out to be a dry few weeks. High pressure builds in behind the front giving us a dry Friday and mostly dry weekend. Temperatures will generally stay at or slightly above normal into early August.